I consider myself lucky, nay, blessed to have lived in the Boston area in the '80s. There were so many great venues to see bands, but one stands out as the granddaddy of them all. The dive di tutti dives. A live venue second only to CBGB on the East Coast as a must play. 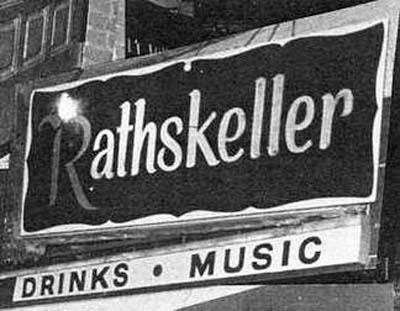 The Rathskeller. Or, as it was more affectionately known, The Rat. I've been taking a walk down Memory Lane as I spark 20+ year-old memories about the bands I saw and the places I had the opportunity to hear them. The Rat was Boston's punk home in Kenmore Square. For the uninitiated, if you've ever seen a Red Sox game on TV and saw the ginormous CITGO sign over the Green Monster - that's Kenmore Square. Anyway, upstairs was a bar and a restaurant, but the happenins took place in the basement, the cellar. Dingy. Dimly lit. It was perfect. Long before I was able to walk through its doors it hosted bands like The Cars, Talking Heads, The Ramones, Mission of Burma - a veritable who's who of the punk and new wave scene. If you were up and coming, you played The Rat. By the time I was able to go to all ages shows (18 and under at the time) or pony up a fake ID or go all legal like, I had the chance to see The Smithereens, Sonic Youth, local ska favorites, Mighty Mighty Bosstones and Bim Skala Bim, and a horrible show by one of my faves early on in their stellar career, The Pixies. I heard local punk stars, Gang Green, cover 'Til Tuesday's "Voices Carry" (1985?) and I saw Dropkick Murphys there about a year before The Rat closed its doors for good. I know there were others - lots of local bands - but the memory is not what it once was.